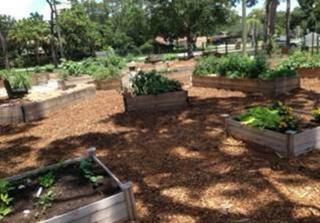 Sarasota’s newest community garden celebrated its Grand Opening in October 2013. The garden serves the needs of the working community in the Bee Ridge neighborhood vicinity. This garden features 24 plots, lovely raised beds and a paver pathway, installed through the hard work of local volunteers. Most start-up costs were provided through a Sarasota County Neighborhood Grant.